The Kerala Public Service Commission (KSPC), the largest recruiting board has announced the date and other details of the Draftsman Grade I (Civil). As per the schedule, the exam will be held on 24th June 2014 Tuesday from 07.30 AM to 09.15 AM. 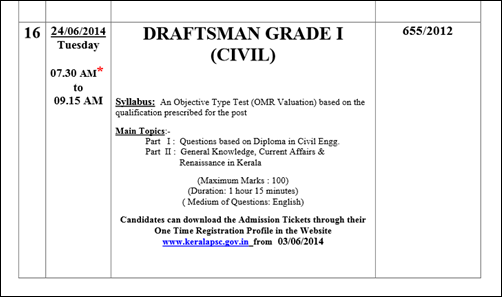 Candidates those who had applied for the Draftsman Grade I (Civil) exam can download the admission tickets through their one time registration profile in the website www.keralapsc.gov.in from 3rd June 2014. The preliminarily test consists of an objective type exam (OMR Valuation) based on the qualification prearranged for the post. The duration of the exam will be 1 hour 15 minutes with maximum marks 100. The syllabus is divided into 2 parts; Part I dealing with questions based on Diploma in Civil Engineering while Part II is based on General Knowledge, Current Affairs & Renaissance in Kerala. Students have to go through the details on Important Events/ Movements/Leaders related to the renaissance period. The scale of pay for Draftsman Grade I is 7990-12930 (Pre-revised). Fifteen (15) vacancies have been reported from the Kerala State Housing Board. It is very important to go remember the following points while preparing for the exam. Other than the main topics in the syllabus, questions from other areas associated with the educational qualifications prescribed for the post might also appear in the question paper. All the topics cited under the sub head "Main Topics" may not be covered in the question paper. Along with the Identification Certificate attached to the admission tickets, candidates should have to bring the original of any one of the following documents to prove their identity during the time of examination. Voters Identity Card, Passport, PAN Card, Driving License, AADHAAR card issued by the Central Government. (Check the official website of Kerala Public Service Commission to get the complete list of the identity documents). Those candidates who fail to produce the original identity proof will not be permitted to attend the examination. It is very important to have a deep preparation and a mastery over the subject to score high marks to get listed. As the number of vacancy is limited, candidates must be through with the portions related to Diploma in Civil Engineering, General Knowledge, Current Affairs & Renaissance in Kerala. While during the exam, candidates must try to give prior importance to answer easy questions first. As much practice is needed to answer all the questions in stipulated time, students are advised to take mock tests which would help the students develop a positive attitude. At the same time it will also reduce the exam pressure build up on them.